Permanent magnet D.C. motors are small as that of ordinary d.c. shunt motor with the difference that there is permanent magnet instead of stationary field winding for producing the required magnetic flux. These stationary electromagnets are fixed to the outer shell of the motor. The constructional features of permanent magnet d.c. motor is shown in the Fig. 1. As seen from the figure the cylindrical steel stator supporting the electromagnets also provides return path for magnetic flux as it is made up of magnetic material. The armature (or rotor) consists of stator windings, commutator segments and brushes same as those in conventional d.c. motors. The stator is having some structure having cylindrical shell of uniform thickness which is magnetized in radial direction. The material used for permanent magnet is having high residual flux density and high coercivity. For the motors having the rating up to 150 kW the material like Alnico may be used. The ferrite magnets are used in the fractional kilowatt motors while rate earht magnets even though costly are economical in small and large motors. The material used in rate earth magnets are newly developed materials like somarium cobalt and neodymium-iron-cobalt which gives high residual flux density, high coercivity with maximum energy product. The latest trend is to use neaodymium-iron-boran material which gives larger flux density, coercivity and maximum energy product than somarium cobalt. It is also having good mechanical properties and comparatively less expensive. These motors normally run on 6 V, 12 V or 24 V d.c. supply. This d.c. supply can made be available from batteries or from rectification (a.c. to d.c.). 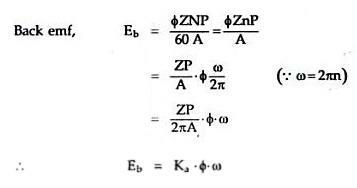 Because of the interaction between flux produced by permanent magnets and current carried by the armature, the torque is produced. The equivalent circuit of a permanent magnet d,c, motor is as shown in the Fig. 2. 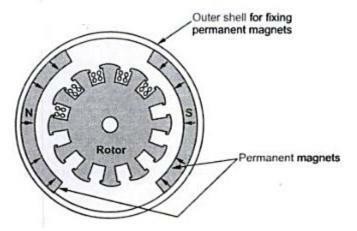 The set of typical performance characteristics of permanent magnet DC motors are shown in the Fig. 3. 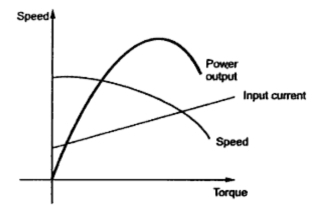 The speed-torque characteristics are almost linear which makes it suitable in servomotors. With increase in torque the current also increases. The efficiency of these motors is better then conventional motors owing to absence of field losses. As the field flux is remaining constant, the speed control is not possible with flux control method. Thus the method used for speed control is armature control using a rheostat or using electronic circuits. The speeds obtained are below the normal speeds. 5. The motors designed up to 12 V or less produces less TV and radio interference. 1. The excessive currents in the armature windings of these motors may demagnetize the permanent magnets because of armature reaction mmf. The other sources of demagnetization are improper design, or brush shift or temperature effects. These motors are extensively used in automobiles for windshield wipers and washers. They are also used in blowers used in heaters and air conditioners. They are also used to raise and lower windows and in slot cars. Fort disc drives in personal computers these motors are used.The rating available for these motors is up to 150 kW. These motors may also be used in applications such as fans and radio antennas, electrical fuel pumps, marine engine starters, wheel chairs and cordless power tools. In toy industry, tooth brush, food mixer, ice crusher, vacuum cleaner and in portable electric tools these motors are extensively used. There is nothing permanent except change. See the link below for more info.